It’s late afternoon. You’re in your favorite neighborhood café, sipping a latte and scrolling through Twitter while you wait for that friend who’s always late. The place is empty save a few regulars—the young actress studying lines, the retired couple swapping sections of the New York Times—and quiet except for the gentle clinking of dishes and an old Crosby, Stills & Nash album playing on low. The recipient of the Israel Prize for economics, among a host of other awards, he’s the co-author, with Martin J. Osborne, of the groundbreaking textbook A Course in Game Theory and one of the researchers who first brought the work of John Nash (of A Beautiful Mind fame) to the attention of the Nobel Prize committee. So what’s he doing in the shabby little coffeehouse on your block? Rubinstein first fell in love with cafés in 1978 on a visit to Vienna, and quickly learned that, like many great thinkers before him, he’s the type who prefers the gentle commotion of the coffee shop to the sterile silence of an office. On that first encounter with Viennese café culture as a PhD student, he joined the ranks of 19th-century artists, politicians, and writers like Gustav Klimt, Sigmund Freud, and Leon Trotsky in an intellectual tradition that stretches back even further: Many a scholar of the Enlightenment has argued that the caffeine-fueled conversations in coffeehouses (of which Vienna is said to have had at least 60 by 1760!) are what enabled that historic revolution in thinking. And our beloved Greenwich Village, of course, has its own history of coffeehouse radicalism. Edna St. Vincent Millay wrote her famous line “My candle burns at both ends” at a favorite spot Christopher Street owned by Bohemian café queen Romany Marie, who went into the business when she got tired of restaurant owners snubbing her artist friends for lingering too long over dinner. The Caffe Reggio, said to have introduced cappuccino to America when it opened in 1927, and its neighbors on MacDougal Street became favorite hangouts for artists from W.H. Auden to James Baldwin. The now-defunct Gas Light café was home base for Jack Kerouac, Allen Ginsberg, and the other poets of the Beat Generation, and Bob Dylan famously got his start performing in coffeehouses all around the neighborhood. But in the decades since that first trip to Vienna, Rubinstein’s appetite for cafés has come to stretch far beyond such well-known hotspots. As he’s traveled the world for conferences and lectures, he’s become a trusted, if informal, global authority on the subject. Rubinstein distributes the posters, free of charge, to anyone who requests them, which means he finds himself headed to the post office about once a month to mail out a new batch—on his own dime. When NYU Stories asked Rubinstein if he’d meet us at a favorite coffee shop near NYU’s Washington Square Park campus, he hesitated, noting that despite its storied past, today’s “Village isn’t especially strong in such places.” These days he tends to prefer Brooklyn coffee shops to Manhattan ones (lower rents, better neighborhood vibes, fewer “no laptop” signs), but he is a longtime devotee of the Upper West Side’s Hungarian Pastry Shop, where the jacket for his book Economic Fables appears alongside those of novelists Sebastian Junger (A Perfect Storm) and Nathan Englander (The Relief of Unbearable Urges) on the café’s wall in tribute to authors who write there. When we met there one frigid winter morning, he ordered a cup of hot water (for which his effusive efforts to pay were declined with a wave) and mixed into it a small packet of instant coffee that he produced from a pocket in his backpack. Then, with soft-spoken charm and humility, he held forth on the subtle social contribution a good coffee shop can bring to otherwise solitary pursuits. What makes a café one where you can think? Lots of people ask me that question, and though I talk about it a lot, I’m not sure I know the answer. It reminds me of the question “What is a good picture,” in a sense. But I think that there are some key ingredients as far as I can judge. Number one is the light—it should not be too dark, but it should not be too bright. Direct sun is terrible for me, and I think it’s very bad for my mind. Plus in direct sun the place will become very hot. Number two is the noise. Think Coffee on Mercer, as I’m sure you know, is way too loud. Let’s think of that as an extreme! The best you can do is hope someone forgets to turn the music on and then you get a few hours of quiet. This music [at Housing Works] is okay, but I would prefer a little bit less. So it’s the sound, it’s the light, it’s the temperature—it should be comfortable. Then there’s the attitude of the owner or the waiters. They should welcome you to sit, and not look at you as though there’s someone else waiting for your table. And it should not be a chain. I don’t deal with chains. It should have an owner that loves the place. What about food? And, of course, drinks? Good food is not important—actually in some sense the opposite is true! If I’m sitting someplace for four or five hours, the danger is that I take another bite and then another—usually of something sweet or a lot of calories—so I prefer places with bad food. Bad food is better. And the quality of the coffee is completely immaterial. I hate the smell of coffee—I cannot even enter a Starbucks. So it’s only the atmosphere that matters, and I don’t mind if the places are empty—I feel very at ease if there are only one or two people. There is a café that in Tel Aviv that I go to once every two weeks, more or less, and it’s nice to have a three or five minute conversation with the people who are always there, to say “Hi, how are you?” or to hear some interesting idea, and then continue with my work. People know from my face not to disturb me when I’m sitting there working. I am not alone: I’m socially active on one side, and on the other side I’m doing my work. That’s ideal. Better than working in your office or a library? I’m very serious about this—I think cafés have real academic value. It’s not just for fun. For fun, there are bars and sports, but there are many people who find cafés a very nice, very comfortable, very relaxing, very inspiring place for work. There is by nature a basic conflict in the life of an academic between a social life and academic life. In academic life, in some sense, you are lonely, whereas in social life you are with people. I think that a café is a nice bridge between the two. You can do both. I really feel that some of the cafés in the world are intellectual environments not less than Harvard. You know, I’m an establishment guy—a professor here at NYU and a professor in Tel Aviv, and I’m enjoying that life. But I have to say that sometimes seeing people sit, and work, and write, and think in a café makes me...well not quite envy them, but admire them. This is partly a self-criticism or self-reflection about who I am and what I do in life. What’s the greatest epiphany you’ve had in a café? It’s hard to say, but the main idea of what we call “the absent-minded driver’s paradox” (see pages 7 and 8 in this paper) was created in Cafe Tamar in Tel Aviv. Were you in cafés as a child? No, not at all. I was born and brought up in Jerusalem. During my childhood, some of the old generation who came from Europe sat for hours in the café, not working, but chatting. That was not a place where I would feel comfortable. Now, of course, I miss those places, as they don’t exist anymore. Really the first time I went in a café was when I was 27, and I went to Vienna for my first international conference. It was my first time leaving Israel, and the place fit my romantic image of cafés where intellectuals would sit for a long time and debate. Oh yes. In a café in Amsterdam recently I saw these two people—a man and a woman—who were not young, and who were sitting not quite together, but there was clearly something there between them. I don’t quite know what. I’m always surprised to see that sort of gentle interaction between people. What’s the most unusual café you visited recently? I went to Seoul, Korea last summer for the first time, where everyone seemed very crazy about studying for many hours, very very late. The café there reminded me very much of a library. Every time I visit a foreign city, it’s a whole process to find a new place. I feel like my heart is beating, getting ready to see something new. What will I find here? I’m amazed to find that’s what I feel. Are café owners generally flattered to be included in your directory? Oh yes, sometimes very much. Sometimes small cafés are so excited to be included that they put my poster up on their wall. And not just cafés! 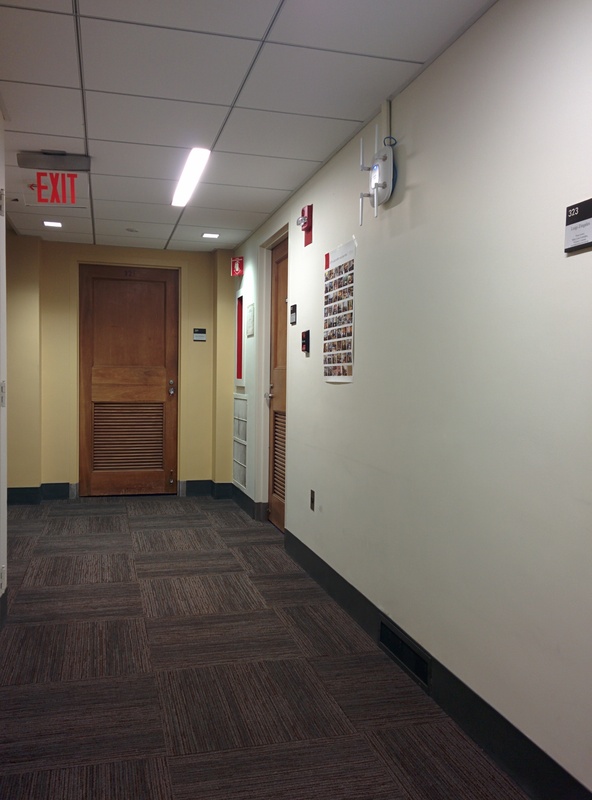 The other day, for example, a friend sent me a picture of my poster hanging in a corridor at Harvard—which of course I immediately posted on Facebook. The “University of Cafés” gives me the feeling I’m doing something good for people. It’s a way of communicating with a smile. The amount of people who read my economics articles is between zero and 10—maybe 20, if I’m lucky. So really this is my way of communicating. I don’t charge for the poster because it is my feeling that this is my contribution to the world.